The Ball Freshet automatic home canning system (for water Bath canning - high acid foods like tomatoes) (this is not for low acid foods, like beans, that would use a pressure Canner. This is not a pressure Canner) has been designed entirely with one point in mind: to take the guesswork out of canning. 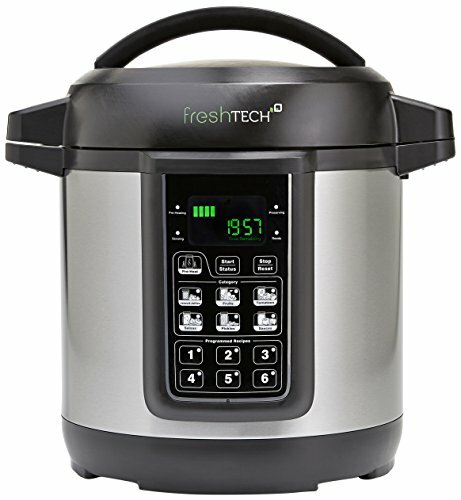 Made with smart preserve technology, the auto Canner controls the exact time and temperature needed to can our most popular recipes all on its own. It even senses and adjusts for your altitude. These recipes are preprogrammed into the appliance, so we can guarantee your food will be perfectly preserved every time!. Recipe booklet and owner's manual comes complete with 26 of our most popular ball canning recipes, specially designed for the auto canner, and 25 meal-planning ideas to help you share your creations with friends and family.